Its the only kind of freedom that matters. - The Mission Row Police Station has a fully modelled basement and another officer beyond the door by the right at the lobby. 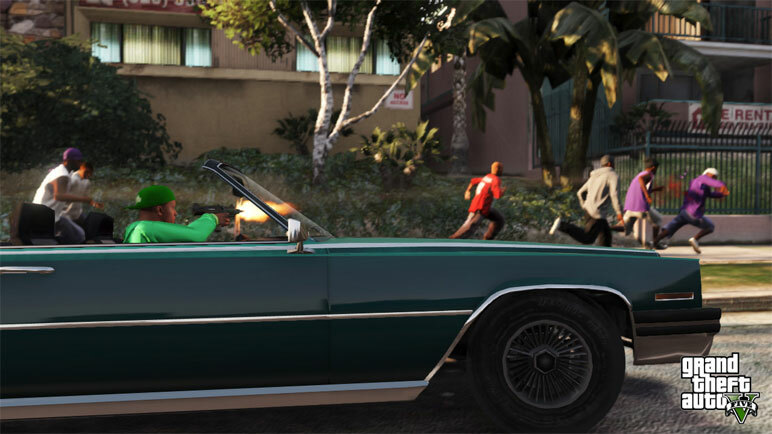 - One of the white cops variation had hair. - Paramedics had darker uniforms. - The shop in Portola drive despicting a naked man holding a shopping bag originally had nothing on the side, the Windows were pretty much reflective. - Inside of the Fort Zancudo base soldiers in excersising clothes cwould spawn. New layout, nice, and appears that the police maverick originally flew much lower than in it's present state. ALSO: Any finds if bears are in the files? It seems like Franklin originally had an orange/yellow 9F instead of a Buffalo. Also, as seen on TV ads, hospitals were enterable. This shirt was removed.. right ? you cant swim two at the same time right ? The apartment from the commercial is no longer there. It is the Tinsel Towers building. There is two apartments in that building and neither match the floorplan, flooring from the video. Look closely at it when the jet flies by and the angle of the Beverly Hills police/fire dept. Now land a chopper on the roof and hover what would be a floor or two higher and that looks like where the apartment would have been. I'd guess the building was remodeled from early writes or a few floors and one apartment were removed. Nope. There are Huskies and Horses though. You can buy it in Vinewood masks shop IIRC. Didn't read through the whole thread, so sorry if I'm repeating anything. 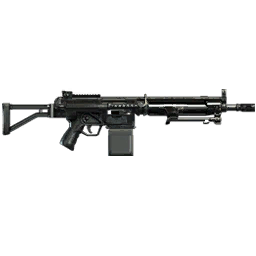 The advanced rifle was originally based off the SCAR. There was also going to be a Shovel, and Assault Sniper rifle. There's also laser gun settings in the game, it's unknown if they're used AFAIK. Handling info for a vehicle called Winky, which is probably a light van, but that was also in MP3. And other vehicles in MP3's handling; Napalm, Skamp, and Autogyro. There was a mission where you used the forklift to pick up crates. Brucie was supposed to be in the game in a mission. Franklin had 2 more sets of random encounters, 2 for a guy called Dale, and 5 between 2 fighting neighbors. Michael had a 2 cut random encounters, both with a lady called Magenta. Then there was 2 missions about a band, the first to keep them together, then you had to stop Trevor from sabotaging their concert. And some mini-games like pimping, basketball, air hockey, pool, lifting weights, stealing/exporting cars. All sources are in the link in my sig. These two neighbors are the "Mrs. Bell" and "Mrs. Avery" from the leaked casting call. If I remember correctly, when you replied to a text message, the text on the phone would read "Choose a reply." However, there would only be one option. I think this was removed in a later update. Maybe you could originally give a nice or mean responce when replying to texts, similar to how you could choose the reply in IV's emails? Great point, it was in GTA IV for e-mails, and for some e-mails in GTA V too right. I've the scuba diving I think, but what do you mean by not the same plane, you shoot down a shamal right? Do you mean different paintjob. I just noticed something. At the starting cutscene of Blitz Play, Trevor says "At least we aren't wearing clown outfits". Maybe that's a reference to the cut heist? Which, I supposed, was going to be before Blitz Play? Actually it's a reference to the fact that Trevor is scared of clowns. That, or it's a nudge to the Payday series, as those involve heists and clown masks. Probably a reference to both. Even scared of clowns, that'd be too much of a random comment. 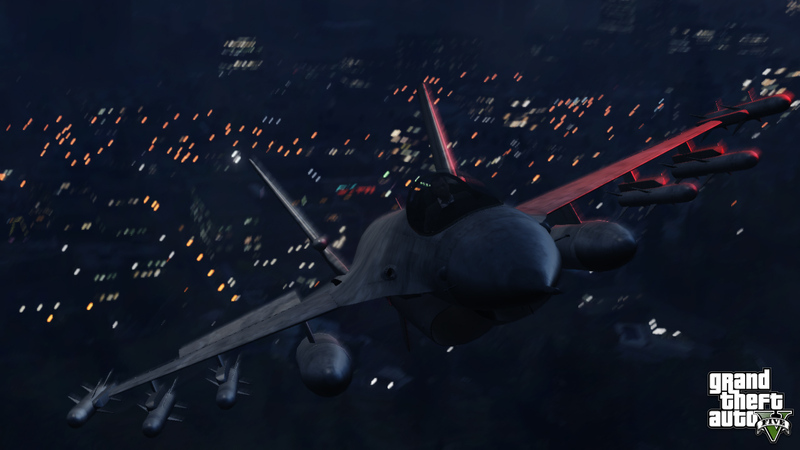 By the way, I know this can be done at any point of gameplay, but R* usually uses mission screenshots for screenshots of normal things, so I guess this might be an screenshot of the Hydra steal mission? And what about this screenshot? 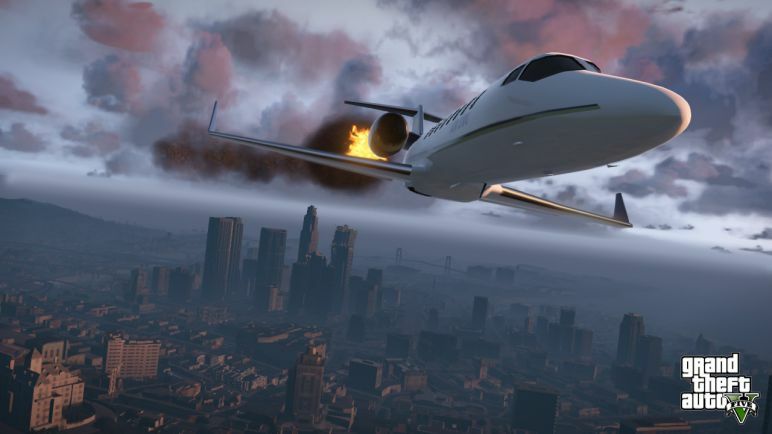 Seems like a Maze Bank heist (show also during old artwork) that's not in the actual game. Remember guys some of this stuff could be held back for DLC. I remember hearing that we could see npc's diving and looting for treasure. 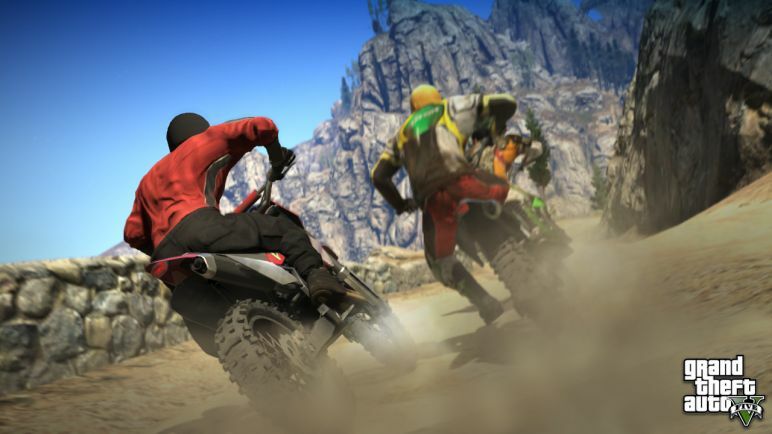 Good finds, I wondered about that screenshot also, possibly just a pic of the three of them hanging out in free roam. - Simeon was shown to be the "Employee of the Month", likely in an effort to conceal Franklin's last name. - Amanda originally wore a bath robe in Did Somebody Say Yoga? 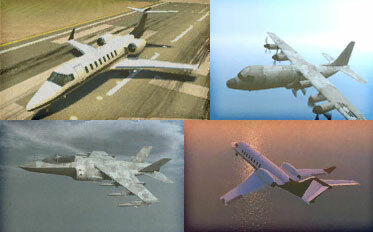 Have we compared the Max Payne 3 planes to the final build yet? I would check, but my 360 RRoD'd(again). It'll be good to have a PC release. It would make going through the files a lot easier and give us clearer images. Ah yes, almost forgot about this! Appears shamal had different paintjob and beta Hydra and/or Lazer, very nice. -IIRC that's definitely a very early cut hoodie, it doesn't even have the green details from the Franklin trailer. -I don't know if it's the perspective, but that doesn't look like a flat-brimmed cap Franklin usually wears, perhaps a beta model. Also the mint feud hoodie was in the normal version of the game at one point. 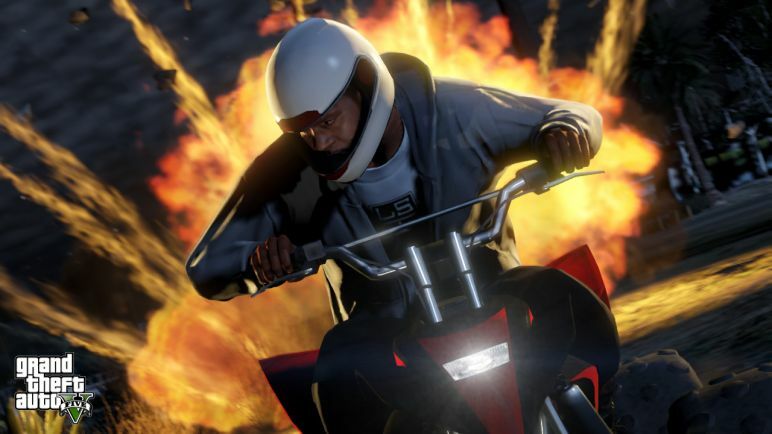 -The parachute outfit was originally used for motocross races. 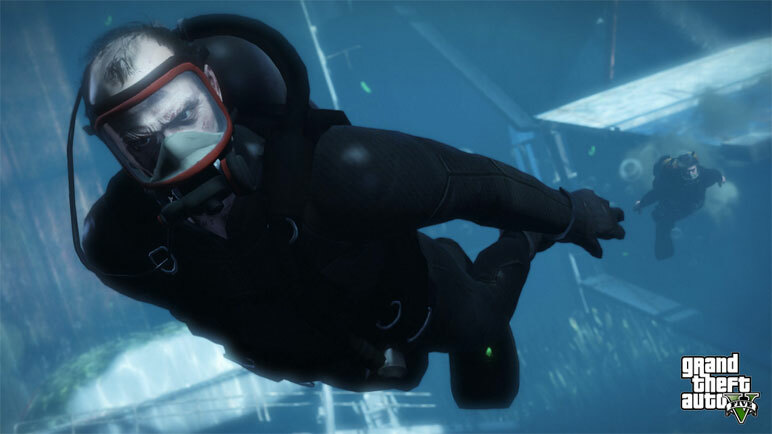 This Underwater image of Trevor and Michael are from the Humane Labs "score" for the FIB. Maybe Trevor was suposed to go in instead of piloting the choppa. Or maybe for the Marryweather heist, during the on shore approach.. So, OP, you said there are leaked DLC screenshots of the Assault Sniper. Care to provide a screenshot, please? Edit: Apparently, there were going to be emergency species that could either make you some extra moeny at the Hunting minigame at expense of an wanted level, or just at free roam. Sorry, didn't mean to sound hostile. Hm, I remember this screenshot. Wonder what was there to the right. Good question, that's what we are here to find out... kind of... but I digress. This is Hud.ctd in part2.rpf/data/cdimages/scaleform_generic.rpf/. There's a M14 which I assume is the Assault Sniper, a SCAR which was the original Advanced Rifle, another LMG not in the game, a missile, a bullet, and some futuristic XM25 looking rifle. I don't understand why R* cut the weapon icons changing according to attachments. 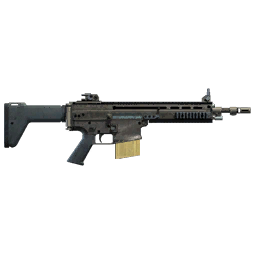 By the way, that SCAR-H looks so weird. 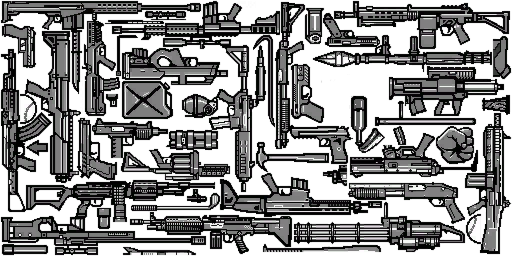 And it seems like originally, there were going to be various different kinds of grips for weapons. 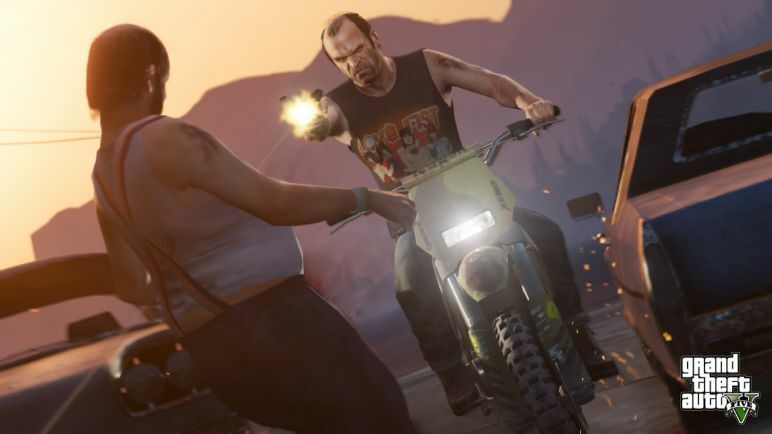 The bullet/missile icons are used on the Lazer/Buzzard. And according to your thread on ps3hax, there was a lasso in game? 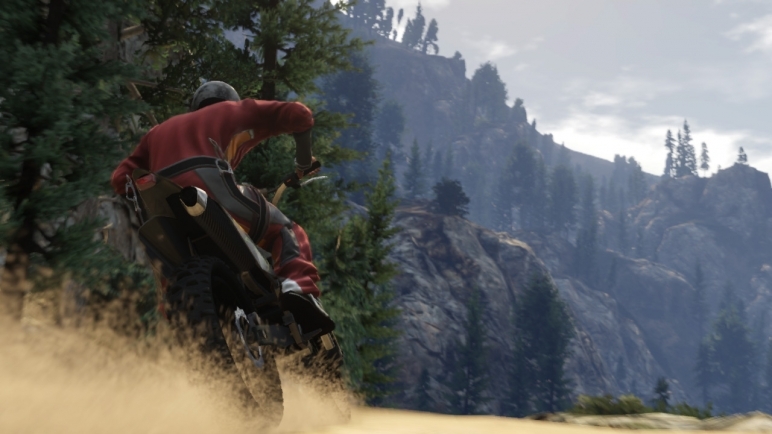 R* cut the lasso? Really? What the hell.